Read the full story by Joni B. Cole, published by the Tuck School of Business. Oberg took the job anyway. 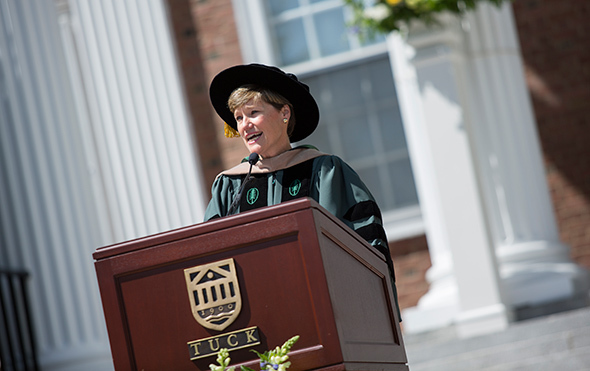 In her address to 280 MBA graduates at Tuck Investiture June 7, Oberg used this story as a jumping-off point for three lessons she learned after business school. The first: how to take risks. Oberg explained that she took the job with Acusphere in 1993 partly because she’d been the one to convince her venture capital firm to invest in the company. While the drug company had sound technology, it was behind in its technical milestones, lacked a business plan and CEO, and was down to about three months’ worth of cash. Still, Oberg believed new business leadership could save the young firm. In addition, she recognized it as a rare opportunity for a former history major, one with no CEO experience, to potentially advance her career faster and further than via a more traditional career path.